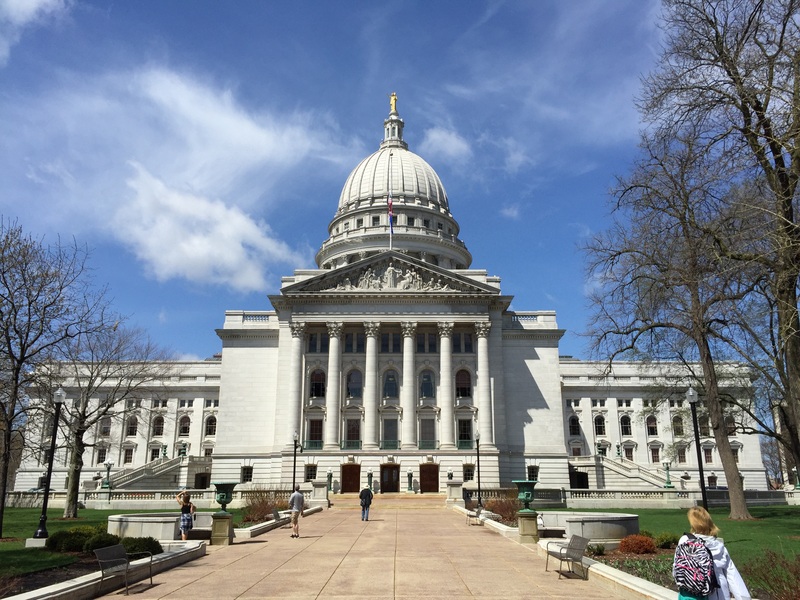 The battle lines for the fall elections in Wisconsin started earlier this year, like most wars, as a muddle, but are becoming more defined as the skirmishes for the Democratic Party primary flush out candidate positions or non-positions. Just as the Republicans ran an all-out, one-note, anti-Obama campaign in 2016, the Democrats in Wisconsin are running what is shaping up this hot summer as a largely anti-Scott Walker campaign. The Dems have been more reactive than proactive. It doesn’t take much imagination to run again someone else’s agenda, but at least it creates a clear choice for voters in one of most purple of states, split right down the middle between Republicans and Democrats. To understand the state’s bipolar politics, look at our two U.S. Senators. Republican Ron Johnson is one of the most conservative in the Senate, and Democrat Tammy Baldwin, is one of the most liberal. Both do head fakes towards the middle, looking for support from independents, but that’s not where they live. The eight Democrats running for the gold ring in the Aug. 14 primary to decide who takes on two-term Gov. Walker are hitting many of the same notes on the campaign trail. The octet is singing in harmony by promising to reverse the Act 10 restrictions on public employee unions, to undo the $4 billion deal with Foxconn, to pump more money into education than Walker and to increase subsidies in one form or another for health care. The Foxconn opposition is based on polls that show the massive Racine project is unpopular up state. But politically astute Foxconn is spreading a few dollars on old downtown buildings for innovation centers in Milwaukee, Green Bay and Eau Claire. These a hundred dollar chips in a billion dollar poker game. No one really knows how the Walker-Foxconn bet will play out. The subsidies are more than $300,000 per job created, way more than any previous inducements. But the Democrats, who seldom come off as pro growth, cannot say it isn’t a bold play. One the governor’s side, he is pretty much sticking to his track record. He will talk endlessly about the state’s low unemployment rate of 2.8%, knowing full well that all governors have less to do with job trends in the short run than do national trends. The Democrats say he could have done better, that the state’s job growth rate still lags the nation. The latter is true. They will have a tough time, though, with that argument when there are more jobs that people to fill them and when wages are finally moving upward. In reality, the worker shortage has become a constraint on economic growth. None of the candidates have addressed the brain drain from the state, which moderated last year but has been running are some 10,000 college graduates per year. Both parties are fully behind workforce training. It’s necessary, safe ground, but not a party differentiator. Several of the Democrats have proposed free education at the technical college and two-year community college level. That’s unique, but has lacked a fiscal note – how it gets paid for. Both parties are ducking major issues. The Democrats have been silent on how to increase economic strategy, always showing a certain antipathy for the corporations that make the economy go round. Neither party has shown much leadership on stimulating the startup economy, despite the recent learning that entrepreneurs reinvent the economy and create most of the new jobs. Both parties are paying needed attention to the opioid crisis. The GOP has developed a blind spot on the environment. The want fewer regulations on development, but look past the enormous challenges to the Great Lakes, like the dead zone in Green Bay, the mussel invasion that came through the St. Lawrence Seaway and wreaks havoc on the fishery and the Asian Carp that will soon be ripping up the five lakes. The Democrats worry about access to health care and want to make it free. The Republicans worry about the high taxes to pay for care. Neither has a clue about managing the costs that are driving prices of care to obscene levels. Gov. Walker has chosen the debt route to fund highway construction. The Democrats want to raise taxes to fund the big highway costs. All in, there are enough differences for voters to make a choice. It would be even easier of the parties would take on all the tough issues. Of course, the wild card in all of the above is the Trump factor. The president’s minority base adores him. His opponents don’t oppose him; the despise him. Above all, he is divisive. Voters in the middle are still trying to figure out just what he is. How his impact plays out this fall in Wisconsin, a state he carried in 2016, is anyone’s guess. Mr. Torinus … did you write this before Trump played the role of lapdog/puppet to the murderer KBG agent Putin who by the way attacked the USA in his attempt to do what Russia has long claimed it would do … bury the USA? -After Trumps Helsinki Putin love fest is there any doubt ? -I can’t believe the President of the United States is incapable of using the English language . ( Could / couldn’t , do / don’t , will / won’t ,should / shouldn’t —-GET IT DONNY ???). John is that all you have the Republicans have a blind spot for the environment. Where is that on voters priorities? I guess if you’re against banning paper straws in businesses your evil. Second, will the Democrats point out the large state deficit caused by Fox Con in the state budget over the next ten years. Wisconsin is in an economic golden age as Illinois residents and businesses flee their Democratic hell and head to a state run by adults. John, we are seeing our kids leaving cause of lack of jobs in Tech. Foxconn, the best business deal in history of Wisconsin, will bring 50,000 jobs to SE Wisconsin, the first big time entry we have in Tech business: Johnson Control, All en Bradley. WE will need 10-20,000 new houses in the end decade so we will have giant increase in jobs. Foxconn is agent for other top industries. While the Left chases away business when Cleft. Foxconn attacks people. Maybe this Tech boom will keep our kids home. All my 5 kids have left for fatter jobs elsewhere. So people are fleeing Illinois for Minnesota? No surprise there. But hey keep comparing Wisconsin to the worst example you can think of because that’s better than comparing it to the dozens of states in much better shape. Economic golden age for the wealthy. Not so much for everyone else. And the unemployment rate doesn’t matter when people are making crap wages. Anyone see the recent list of best and worst states to live? Minnesota ranked number three. Wisconsin is not in the top 10. The worst 10 states are all red states. No shocker there. WMD, my guess is your kids left so they wouldn’t be associated with a mouth breathing racist like you! The environment is a big issue yet to be addressed. Water in several parts of the state is undrinkable, algae blooms closing beaches all over the state, and in the central sands groundwater is rapidly being depleted. Someone needs to take a leadership role in environmental and natural resources issues soon, as our own DNR has become a lapdog for WMC and DBA. PMD Minnesota almost went to Trump. Less than a .5 percent loss. Minnesota js going purple…red? 2 typos in this oped. “The” should be “They” when referring to republicans wanting fewer regulations for the environment. Minnesota may have almost flipped but it kept its sanity and now can keep its pride since it did. Minnesota is solid blue. Sorry to have to give you the bad news. That it almost went red in one election matters not. It’s a blue state. They have Muslim elected representatives! The first Somali-American elected official! The horror Troll. I know just the thought of that keeps you up at night and makes your old white bones quiver in fear.